A traditional mid-sized village, Adelboden, in Switzerland with spectacular scenery and modern lifts in the Bernese Oberland region with neighbouring Lenk and Frutigen, is a large resort with 42 lifts (8 chairs, 24 surface lifts) that offers skiers an incredible 1050 metres of vertical descent. 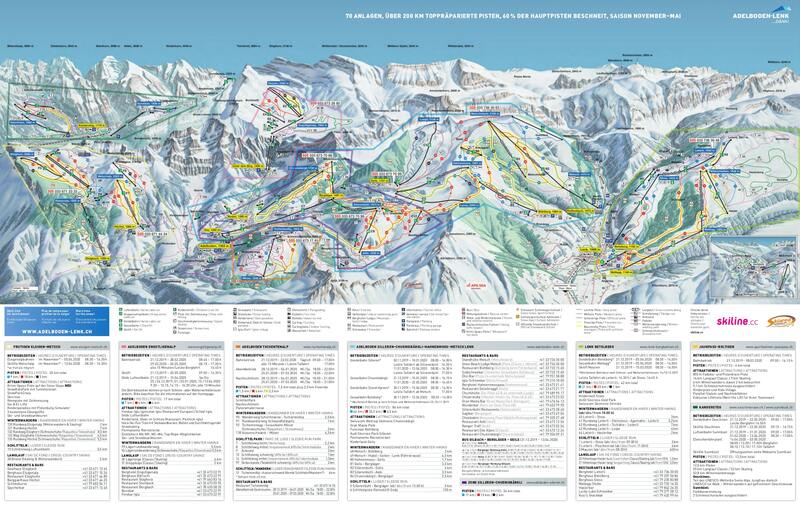 Adelboden has 85 pistes with a total length of 170 kilometers . Adelboden is best suited to intermediate skiers and snowboarders but there is some terrain for beginners and advanced skiers. There are 23 kilometers of cross country ski trails at Adelboden. For snowboarders, there is a terrain park and 2 half pipes. About one third of the pistes at Adelboden are covered by snow-making. The region is most famous for its Chuenisbergli race course on which World Cup races are staged each January. The closest airport is at Geneva but at 3 hours, the transfer time is very slow. The nearest train station to Adelboden is at Frutigen. There is accommodation located close to the pistes Off the slopes there is a long list of alternatives and attracts a large number of non skiing guests. There's everything from a fondue in an igloo to a visit to the new Tropical Centre at Frutigen, an amazing complex created when the new BASE rail tunnel from the north of the country cut travel times from Zurich by an hour or so. A by-product of the tunnel, which runs hundreds of metres below the mountain, is a constant flow of hot thermal water used by the Thermal Centre to cultivate tropical plants, with fruit used in local restaurants.